On October 24, more than 350 picketers turned out for a rally and picket line at EA offices in Playa Vista, Calif. in response to failed negotiations with video gaming companies that union officials say have been unwilling to meet even close to where the needs of its members are. The strike involves the following video game employers: Activision Publishing, Inc.; Blindlight, LLC; Corps of Discovery Films; Disney Character Voices, Inc.; Electronic Arts Productions, Inc.; Formosa Interactive, LLC; Insomniac Games, Inc.; Interactive Associates, Inc.; Take 2 Interactive Software; VoiceWorks Productions, Inc.; and WB Games, Inc. The strike applies to games that went into production after February 17, 2015, for the aforementioned employers. 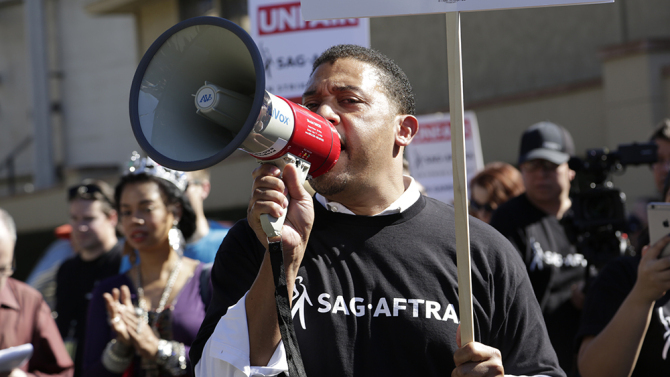 In a statement issued in early October by the union, SAG-AFTRA President Gabrielle Carteris said, “Through many months of bargaining with interactive employers, we have not reached a fair agreement covering SAG-AFTRA performers working in video games – often the most popular games in the world. Our members have been clear, now is the time for employers to negotiate a modern contract that covers this highly profitable industry. “A strike is not to be entered into lightly, but when the employers leave us with no recourse, we must stand firm for our members. It is imperative that we secure for them the protections, compensation and benefits they deserve,” Carteris added. The Union’s Chief Contracts Officer Ray Rodriguez noted that members working in the video game industry were negotiating to reach a fair contract, but that progress had essentially been stalled for more than a year. The AFL-CIO stands in solidarity with the SAG-AFTRA voice-over and motion-capture performers who are on strike after failed negotiations with eleven video game employers. Performers deserve a modern contract that offers the protections necessary to work in today’s video game industry.